Standing on the partially snow covered tundra of the Churchill Wildlife Management Area in Churchill, Manitoba, we were able to capture a picture of the paws and claws on this adult Polar Bear. The feet on a polar bear are five-toed paws and can reach 12 inches in diameter which act like snowshoes when walking across the frozen tundra. 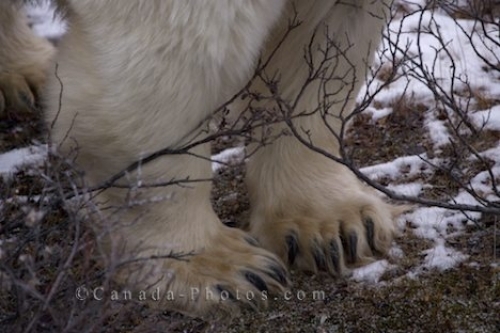 Picture of the massive paws and claws on a Polar Bear in the Churchill Wildlife Management Area in Manitoba, Canada. The sole on a Polar Bear's foot has black pads covered with small, soft bumps which helps this massive animal from slipping. Between each toe, the Polar Bear has long hairs, also aiding the animal in walking proudly across the frozen tundra around the Hudson Bay in Churchill, Manitoba. Paws and claws of an adult Polar Bear, Ursus maritimus, in the Churchill Wildlife Management Area, Hudson Bay, Churchill, Manitoba, Canada.